[19:04] <+Rebecca> The writers of Universal Horizons came to me roughly three years ago and asked if I’d do some illustrations and stories for their game. Of course I had to play it first…and quickly became addicted to it. [19:05] <+Rebecca> Universal Horizons is a fluid genre-shifting tabletop RPG. Written by A. John Schmidt and Dr. John Teske. Illustrated by several people – including me. 🙂 We are currently Kickstarting a Universal Horizons (UH) genre called “Bloodtooth,” which is a retro-gothic alternate reality 1980’s Earth, where vampires, werewolves, and magic exist. [19:05] <+Rebecca> We were just at Gencon and had a lot of interest in the game. Not so sure the Kickstarter will go through at this point (ends tomorrow…), but we’ll try smaller campaigns. It’s a learning process. [19:05] <+Rebecca> This is the first tabletop RPG game I’ve ever played. I don’t know other systems all that well… But I’ll do my best to answer your questions. I’ve been the DM (we call it “Guide”) for my own modules and for modules AJ Schmidt has written, so I know a bit about how UH works. [19:02] <+Gareth> My name is Gareth Johnson. I started playing RPGs when D&D 3.5 was in its prime, but my first game was actually L5R. I’ve always liked a variety of games and am open to most anything. [19:05] <+Gareth> I started working on Pythos about 4 years ago. I was playing around with an idea to make simple simultaneous action combat in an RPG work. When I got most of it down, I decided to build my own setting to put it in. [19:08] <+Gareth> Some of the sources of that inspiration are incorporated directly (such as the names of some gods and monsters) while other inspirations are more subtle, allowing for the mixing of cultures from Earth. [19:03] <+smif> My name is Dan Smith, aka SMIF. I was a major illustration force in the RPG indusrty in the 1990’s. During that time, I created my first game, Battle of the Bands, which I am rebooting now on Kickstarter. [19:03] <+smif> I also dance really good. 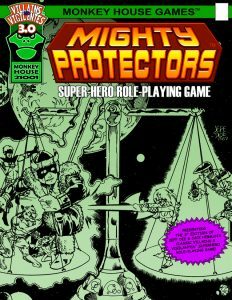 [19:09] <+JeffDee> I’m Jeff Dee, co-author and artist of Villains and Vigilantes, the classic superhero RPG. [19:09] <+JackHerman> And I’m Jack Herman and I’m the co-author of the original Villains and Vigilantes superhero RPG now published by Monkey House Games. [19:10] <+JeffDee> And together we are… the Two Amigos! [19:12] <+JackHerman> After a bazillion years, we brought our game back into print. We recently settled legal action with our old publisher and now we are looking to launch a new edition of our game which we have been working on for the better part of a decade now. [20:46] <+DiasExMachina> My name is Chris Dias from Dias Ex Machina Games. I am the creator of the settings Amethyst, Apex, and NeuroSpasta, and also am the force behind Ultramodern4 and the newly released Ultramodern5.